Ben and his team were everything we could possibly hope for. Ben was professional and courteous from the first hello to the thank you handshake at the end. We were always well informed of what was happening in the market around us, as well as during the entire sales process and negotiations. His team was prompt to respond to any questions we had. This team made our house look like a superstar on the market. I very much credit them for getting us the price we wanted. I truly have not one hesitation about Ben and his team, and would use them again in a heartbeat. It was great working with Ben. He was very knowledgeable and always available to answer our questions. He made us feel like he really cared about us. 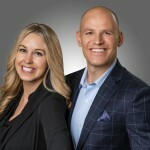 We highly recommend Ben and Meredith if you are selling your home. Ben and Meredith were absolute gems to deal with when it came time to purchase my first home. They made things as simple as possible for me to understand, and extremely well laid out. They even helped with finding a good mortgage broker that would help with funding. They were so well versed in the neighbourhoods (i.e. : what was considered a good neighbourhood or not), which was extremely helpful because we were moving to a new city of which we did not know much about. They told us places to avoid, and places to look at. Ben and Meredith helped us develop a list of what we wanted in our property and found us the ideal house. They worked with us to get the best price we could get for the house. Ben was super knowledgable about problematic aspects in houses, and things to look out for. That was so well appreciated. Overall the experience was amazing and we would choose to work with them again in a heartbeat. They were such pleasant, professional people who replied quickly to any questions and concerns. I will definitely be using them again when the time comes to list my own property - they were that good! What should I say, Meredith made the home buying process so easy and simple. I can’t beleive how smoothly the process went to get our dream house. I would definitely reccomend working with Meredith to buy a house. She is the type of person who would also support after the purchase transaction. I look forward to work with her in future as well!!! I found Ben to be helpful, through and thoughtful. He was able to explain the the variables clearly and left my wife and I with a clear understanding of the value of our property. He put us at ease and answered all our questions clearly. I would definitely recommend him.